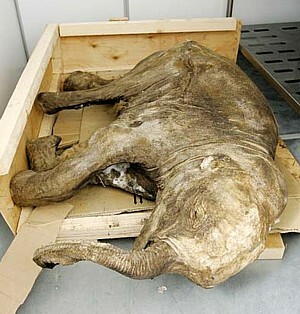 Researchers at Japan's Jikei University will soon be checking the mailbox for a cool package from Siberia -- the recently discovered frozen body of an ancient baby mammoth. The nearly complete body of the female calf, said to be one of the best-preserved specimens of frozen mammoth ever discovered, is estimated to have been less than one year old before it was preserved in ice about 10,000 years ago. According to the Russian Tass news agency, a reindeer herder stumbled upon the 130 cm (4 ft 3 in) tall, 50 kg (110 lbs) frozen mammoth in May in an area of permafrost in northwestern Siberia, near the Yuribey River on the Yamal Peninsula, which extends into the Kara Sea. The mammoth, whose trunk and eyes remain intact and which still has some fur on its body, was shown to an international panel of experts that convened on July 5 in the town of Salekhard, near the discovery site. Preparations are now being made to ship the baby mammoth to Jikei University School of Medicine, where researchers will use advanced computed tomography (CT) scanners to obtain three-dimensional images of its internal organs. "This is the first opportunity for anyone to perform an analysis on a complete mammoth body," says Jikei University professor Naoki Suzuki, "and it should provide a more complete picture of its anatomy and how it lived." On June 11, the Japan Agency for Marine-Earth Science and Technology (JAMSTEC) released photographs of a mysterious deep-sea creature believed to be an unknown species of comb jelly, or ctenophore, a jellyfish-like marine animal. 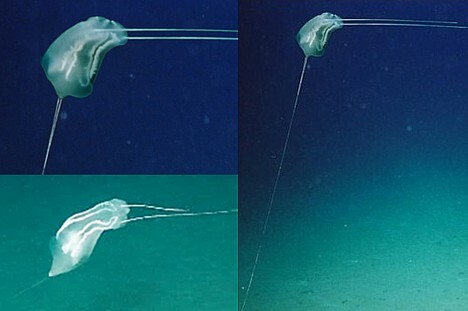 Taken by JAMSTEC's "Kaikou" unmanned submersible at a depth of 7,217 meters (nearly 24,000 feet) in the Ryukyu Trench about 200 kilometers (125 miles) south of Okinawa, the photographs show a gelatinous animal with two pairs of long, spindly tentacles -- one pair extended horizontally in front of its body and one pair stuck to the ocean floor, allowing the creature to float in place like a kite. 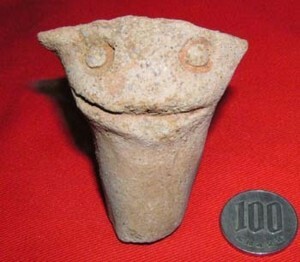 The creature's elongated body is 10 to 20 centimeters (4 to 8 inches) long and 5 to 8 centimeters (2 to 3 inches) wide. The rear tentacles measure 1.5 to 2.5 meters (5 to 8 feet) in length, while the forward-reaching tentacles, which float on the current and catch prey, measure between 1 and 1.5 meters (3 to 5 feet) in length. 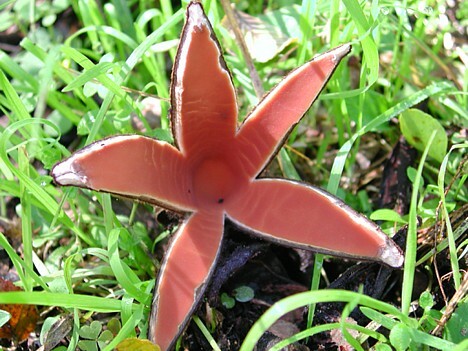 The animal's gastrovascular system, which circulates nutrients through the body, appears whitish in color. 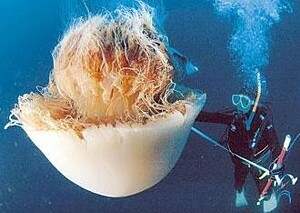 JAMSTEC filmed the gelatinous animal in April 2002, and subsequent research has led the researchers to conclude it is very likely a new species. However, they are unable to say for certain until they capture an actual specimen. In the latest development in Japan's war against giant jellyfish invaders, scientists studying the biochemistry of echizen kurage (Nomura's jellyfish) have discovered a previously unknown type of mucin in the sea creatures. Mucins, the main structural components of mucus, are complex proteins found in human saliva, gastric juice and the lining of the stomach, all of which play a key role in the digestive process. The recently discovered jellyfish mucin, according to the researchers from the Institute of Physical and Chemical Research (RIKEN) and science equipment manufacturer Shinwa Chemical Industries, can be put to use in a variety of pharmaceutical, medical, food and cosmetic products. While the researchers have yet to release the details about the molecular structure of the jellyfish mucin, they claim it has a simple structure similar to a type of glycoprotein (organic molecule composed of protein and sugar chains) found in human digestive fluid, suggesting it could be used as a digestive supplement for elderly people with weak gastric juice. In addition, the researchers see potential uses for jellyfish mucin in products such as eyedrops, artificial saliva and surgical adhesives. At least 12 types of mucins are known to exist in various locations in the human digestive tract, as well as in saliva and in the mammary glands. 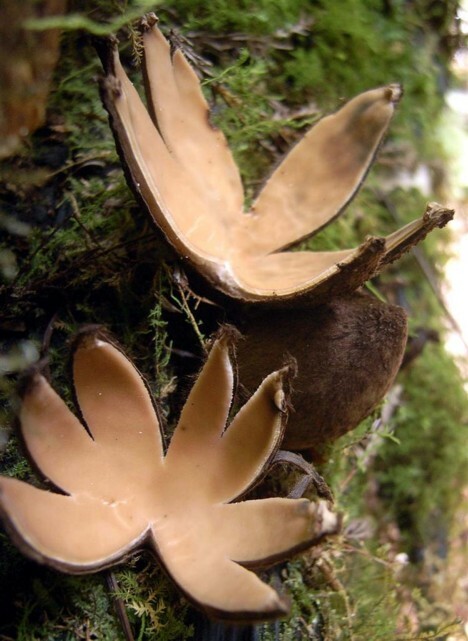 While mucins are also known to exist in animals and in some plants such as okra, lotus root and yams, only a few sources of the slimy substance have been tapped for large-scale commercial production. 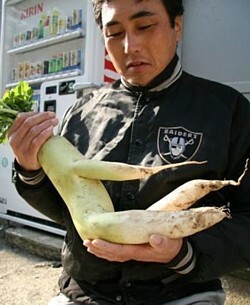 To harvest the jellyfish, RIKEN says it is investigating the possibility of enlisting the help of Japan's fisheries to catch the giant echizen kurage, which can grow up to 2 meters (6 ft 7 in) in diameter and weigh up to 200 kg (440 lb) each. The group is also considering harvesting moon jellyfish, the culprits responsible for disrupting output at nuclear power plants last year after they clogged seawater coolant intake pipes. Business negotiations are now underway between 20 organizations, including pharmaceutical companies, medical institutions and food and cosmetics manufacturers. 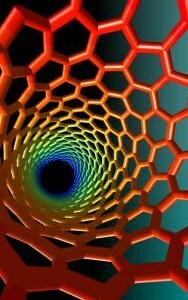 On May 8, researchers from JFE Holdings, Inc. and Shinshu University announced the discovery of a new type of carbon nanotube (CNT) -- a polygonal tube shaped in a spiral configuration. Cross-sections of what are normally round tubes showed a structure with at least six sides. This special structure appeared in CNTs that were synthesized using JFE's production method. The researchers speculate that the polygonal tube spirals arise because the production method�s high temperatures (over 3000 degrees Celsius) lead to high crystallinity, and the rapid cooling causes distortion in the crystal structure. Using an arc discharge method of production, the company has succeeded in synthesizing 100-micrometer (1 micrometer = 1 millionth of a meter) thick CNT tape comprised of tubes with a purity of nearly 100%. This tape, according to the researchers, is the world�s first of its kind. When the researchers analyzed the new CNT structure, they found that electron emission was at least several times better than conventional cylindrical CNTs, and they discovered that its strength as a material was at least dozens of times greater. The company has begun test marketing the polygonal nanotubes, which they call nanocores, for applications in electronics and composite materials. Carbon nanotube tape can be used for such products as field emission displays, next-generation flat-panel displays, fuel cells and semiconductor parts. Scientists have succeeded in unraveling the mystery -- at the protein structure level -- of the mechanism at work in the glowing tail of the "Genji firefly" (Luciola cruciata Motschulsky), which is considered to have the highest luminous efficiency of any known source of light. The results of the joint research carried by the Institute of Physical and Chemical Research (RIKEN) and Kyoto University are to be published in the March 16 edition of the British science journal Nature. 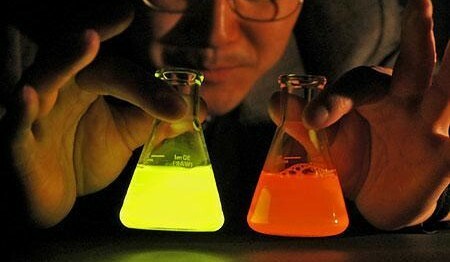 By tinkering with the chemical composition of luciferase (a bioluminescent enzyme), the research team succeeded in changing the emission color from its normal greenish-yellow to orange and red. Researchers are now attempting to recreate the blue glow of the sea firefly (Vargula hilgendorfii) and firefly squid (Watasenia scintillans) in order to have all three primary colors at their fingertips. "This might prove useful in applications such as short-term emergency lighting when no source of electricity or combustion is available," says Kyoto University professor Hiroaki Kato. "Light could be created by mixing up a liquid protein solution." 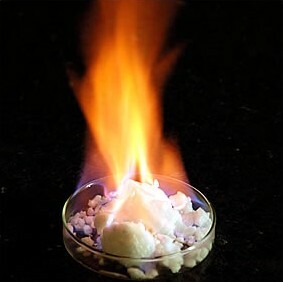 Anytime energy is converted into light, there is some loss due to heat. Luminous efficiency is a measure of the proportion of energy supplied to a light source that is effectively converted into visible light energy (i.e. the amount not lost to heat or infrared radiation). The luminous efficiency of incandescent light bulbs is around 10%, while fluorescent light is around 20% and LED is around 30%. Firefly tails are significantly higher, at 90%. Scientists were aware that the Genji firefly used luciferase in combination with luciferin (a light-emitting substrate) and adenosine triphosphate (ATP) to produce light, but the detailed workings of the mechanism have until now remained a mystery.